I always have miso in the fridge. While it’s not something not usually considered a kitchen staple in North American households, I love having it close by. Not only does it last forever – hello, fermented rice paste! – but there’s something both pungent and mellow about it that makes it pretty versatile. It’s fantastic in vegan gravy, delicious in stirfries and soups, and perfect with cod or salmon. Yeah, I’m a fan. I’ve never tried miso with chicken and I’m so glad that I did. This dish was unbelievable! The garlic, ginger, chili paste and miso all worked its way into the chicken thighs to make some seriously delicious magic. The flavour was deep and despite how it looks, it’s surprisingly not very spicy. If you like a lot of heat, add some sriracha to the mix, but I think this is pretty perfect as is. I wouldn’t change a thing. Miso comes in light and dark versions – I prefer the light version (shiso is my fave) and you can find it in health food stores and Asian markets. And please don’t leave out the chili garlic sauce – it has a special kind of magic all its own. One sniff from the jar and I get all goo-goo faced. You can find it at Asian markets everywhere. elsewhere: Visit Poppytalk to check out my current favorite salad dressing recipe. It’s creamy and delicious over summer greens. Rinse chicken under cold water & pat dry. Remove skin if they aren’t skinless already. Add all ingredients in a small bowl and give it a good mix until you have a fragrant red paste. Put the chicken in a large zip loc bag, pour in the paste make sure the sauce covers the chicken completely. Seal bag tightly. 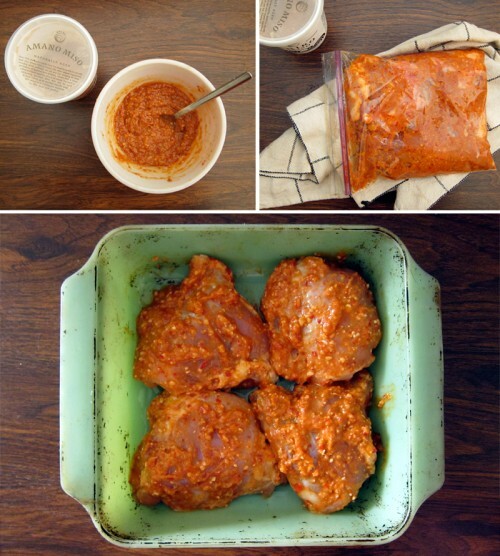 Marinate chicken overnight. Preheat oven to 425°F. Add vegetable oil to the bottom of your baking dish, spreading it around with your hands. 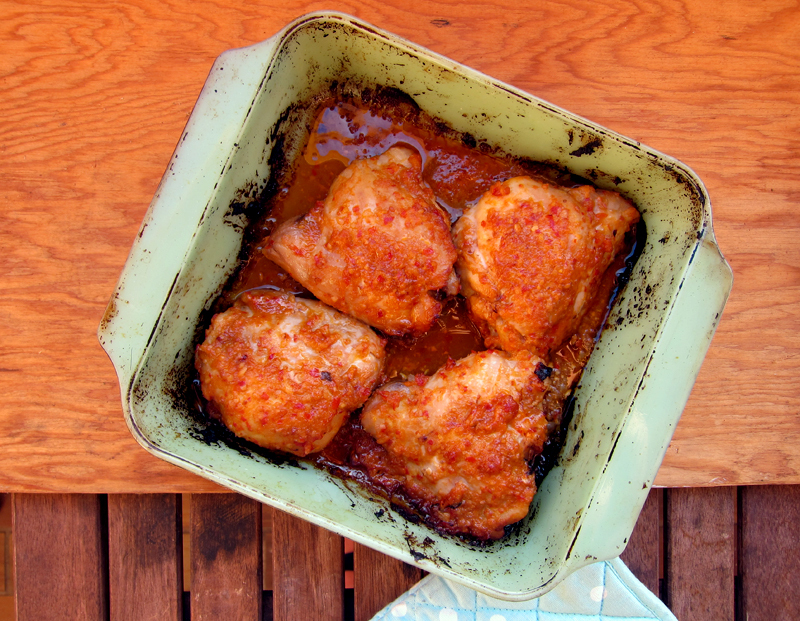 Add chicken on an even layer and bake for 40 minutes, turning chicken over once halfway through baking time. Chicken will be cooked when the juices run clear when pierced with a fork. Remove chicken and let rest for 5 minutes. Serve hot. Miso is one of those ingredients I always keep MEANING to pick up, but never do. You’ve just convinced me. It’s time. I am a great fan of miso. This looks delicious. This marinade is very intriguing– do you think it would work if you grilled the chicken? oh my gosh just reading the ingredient list my tastebuds are watering. love that marinade. yes please! I’ve had a tub of miso paste in my fridge for 5 years! I wonder if it’s still any good? LOL! I haven’t used it in 2 years however. I do like the versatility of miso and that miso gravy rocks my socks so I can only imagine what this miso marinade can do. Joanne, I’m glad I have you convinced. It’s so good and goes with so many different foods! You’ll love it. Thank you, Sophie, it is. Gretchen, yes, I think it would be perfect grilled! But do make sure that you leave the marinade on overnight. Kristel, it does. My jar has been going on for over a year – it’s fermented already. As long as there is no mould on top, you are fine. But if you are worried, I do have a lot of miso recipes on my site to keep that container going! Thanks vanillasugar! It is totally mouthwatering. My husband loved this meal soooo much. Bijoux, 5 years? Wow. I’m sure it’s probably safe still! Ha! So sorry Robert, but making it now and eating it tomorrow sounds about right. Just think, dinner will be awesome. And you probably could get away with less-marinating time too. If so, I’d be curious about the results! Guess what we just had for dinner? That’s right, I saw this yesterday and just had to make it today. I didn’t marinate this over night, in fact it only got 5mins. My hubby and I don’t think it’s necessary. What did we think? The chicken was amazing, i wouldn’t change a thing. I’m about to share this with everyone i know. Thank you. This will be a regular for us now. Sascha, so good to hear that this doesn’t need to be marinated overnight! Hurrah!! Glad you enjoyed this. This looks great! I keep wanting to pick up some miso, but have to convince my husband that it is worth the price. How long does yours last you? Newlywed, is it that expensive? I think it’s around $4 a tub here and that lasts literally forever. We’ve had our tub of miso for well over a year and it’s highly versatile. I made this on the weekend. It did not get an overnight marinade, more like about 5 or 6 hours. It is gob-smackingly good. Thank you for the recipe. 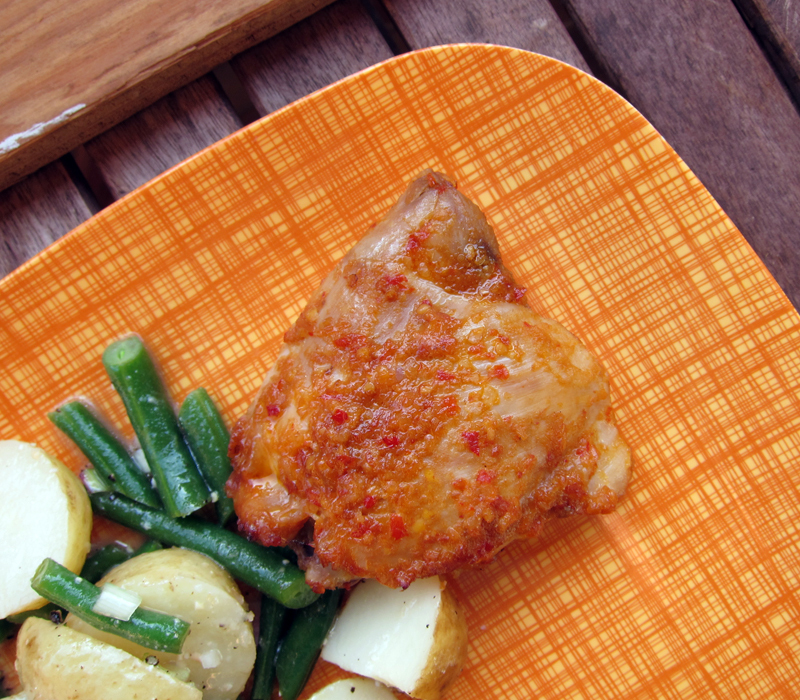 Elsie, so glad that you loved it and great to hear about the shorter marinating time! This recipe sounds amazing! I will definitely have to make this soon. What brand of chili garlic sauce did you use? Hi Jen, Lee Kum Kee is the brand I used for this dish. I found it in my local Asian market. Good luck! was just wondering if the 1TB vegetable has to be added to the marinade and then a separate amount added to the baking dish. OR, is the 1TB simply for the baking dish? Hi LS, the vegetable oil is just for the bottom of the dish so nothing sticks. There is no oil other than the sesame oil in the marinade. Hope that helps! Hello! We had this for dinner the other night and it we really loved it! Thank you! Hooray, so glad you loved it Nicky! What a beautiful blog. Love it!! Thank you Lisa for stopping by! I put up several jars of ginger peach jam recently and had a bit leftover that I didn’t BWB and just refrigerated. I mixed it with miso and a bit of rice vinegar and soy sauce. I used it for a dip for some chicken-flavored seitan cutlets. It turned out remarkably good for a spur of the moment experiment! Miso adds such a nice richness to a dish! LOL, I totally feel you, Robert. Oh looks awesome! I’m thinking of making this for a dinner party. Any ideas for sides or appies? Samantha, you could definitely serve this easily with rice (white or brown) and some lightly steamed vegetables. I think keeping things simple is best since the dish itself has quite a punch. Good luck! Looks great! Can’t wait to try. Thanks for the 2011 recap! Looks awesome! Any down side to use breasts instead of thighs? This is still one of my favorite recipes. I have made this at least once or twice a year for years now. THANK YOU!